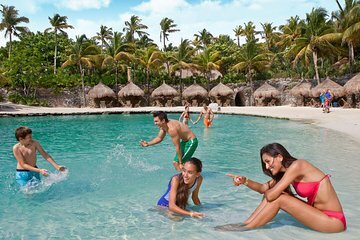 Depart from your Playa del Carmen hotel to begin your exhilarating excursion to the enchanting location of Xcaret. Enjoy the scenery on this short 15-minute ride to the ancient Mayan ceremonial site. Descend to subterranean depths beneath the jungle to explore the sprawling limestone caverns. Navigate the underground labyrinth alongside an experienced guide, encountering diverse wildlife such as macaws, raccoons and monkeys as you explore. Listen to captivating tales of ancient rituals before emerging into the bright sunlight at Mayan Village, a historical hub that explains Mayan customs, social dynamics and village infrastructures. Enjoy a serene stroll down a peaceful trail, stopping to marvel at interesting archeological sights as you walk. Awaken your senses to the sweet aromas of the orchid garden before immersing yourself in the colorful charm of the butterfly pavilion and coral reef aquarium. Revitalise in the refreshing waters of a natural inlet or don snorkelling gear to explore the marine life that resides in the crystal clear pools beside the ocean. Dry off beneath the soothing shade of a palm tree or upon the silken sands of a natural beach. As the sun begins to set, either return to your Playa del Carmen hotel or stay for the sparkling spectacle of the Xcaret Mexico Espectacular, an exuberant show in which over 300 vibrant performers depict Mexican and Mayan history throughout the ages. Admire traditional costumes and vivacious dances during this unforgettable experience. Return to your comfortable minivan after the show’s conclusion for your comfortable journey back to your Playa del Carmen hotel. Upgrade your Xcarat tour to enjoy the following additions to your expedition: a delicious buffet lunch served with zesty orange juice and lemonade; snorkelling gear and the use of Plus Xcaret’s exclusive facilities; private showers and changing room facilities. It is a perfect place that no one should miss it! Tour guide was not very friendly. Had a great, fun filled day. Lots to see and do in one day. Especially enjoyed the underground river swim and the evening Mexico show. Transportation, tourist guide and park amazing!! Great day out! It's full on though, not much relaxing time. You'll need biodegradable sun screen to use in the park, which they sell on the coach at a fair price. My girlfriend did a dolphin experience too, which she loved. The show was great, but the food in the show is very traditional..not 4 all! We went without kids and stayed the whole day, but were never bored! The park is cleverly designed with lots of shaded paths and underground caves - it really helped keep you cool. The evening show is a must-see, but good seats fill up fast. An easy way to get great seating is to buy the dinner and show package. It's relatively inexpensive, open bar, and the food was good. Also get the photo package, it's worth it and there are photo ops everywhere. Long day when there is only one time to return to our hotel and too far to take a taxi back. We could have enjoyed the park in 4 hours not 8 but then we don't have kids. Definitely an experience worth having. Going the through the underground rivers was amazing. Especially the second time when we swam through the bat cave, the Mayan village and the museum. The show at night was thoroughly entertaining. The games, story and history could not have been taught in a more memorable way.